Atlanta is home to countless blossoming neighborhoods. Old Fourth Ward is host to massive apartment and retail projects such as Ponce City Market as throngs of new-generation hipsters flock to the seemingly run-down Cabbagetown area. Out of these up-and-comers, though, Howell Mill is becoming a culinary and shopping Mecca in the heart of the Westside. The popular Yeah! Burger provides a cunning foil to superb fine-dining restaurants Cooks and Soldiers and Chef Ford Fry’s Marcel and JCT, while high-end boutiques Billy Reid and Free People provide excellent retail choices. After its Aug. 24 opening, though, Birmingham-based Revelator Coffee Co. brought a new flavor to the Howell Mill neighborhood. An upscale café with a modern feel and a dedication to their craft, Revelator beautifully fills an essential space in the growth of a culturally budding area. Located under a high-end apartment building, which is also home to Cooks and Soldiers, a couple of shops and its own retail parking deck, Revelator occupies prime real estate with close proximity to railroad tracks and a view of the passing trains. The restaurant’s décor is unrealistically chic. The walls are barren, the furnishings are minimalistic and the bar is neat and free of any sort of stereotypical café clutter, giving the space an avant-garde, modern feel to contrast the historical industrial surroundings (a popular motif in recent Atlantan development). The coffee shop does have some shortcomings in its design though, as the menu is haphazardly leaning against one of the walls (which could use some classy adornments) and, most visually strikingly, the fact that a wonderful outside area overlooking the tracks is being neglected, which is a perfect opportunity for tantalizing outdoor seating. Revelator is also a big space, which creates a quiet echo effect, spawning an environment in which it is awkward to make loud noises or even to converse with gusto. 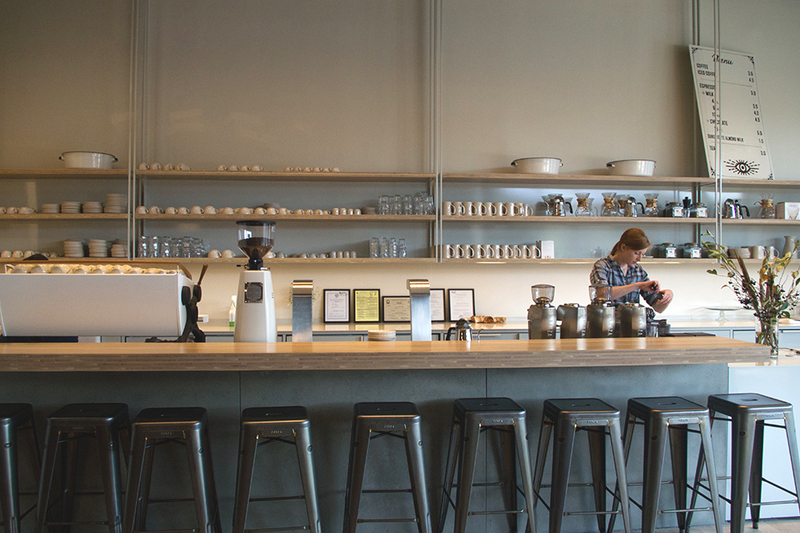 Ultimately, the café has a fantastic style in theory and much potential, but it lacks a certain warmth that is attained by prime Atlantan coffee shops such as Amélie’s and Dancing Goats. That being said, the new restaurant is only entering its third week since opening, so it is naturally still seeking its unique personal charm. The main issue with the café was the lack of an iced coffee selection, but an iced americano from one of their stellar Slayer espresso machines proved to be a worthy alternative. A true gem for coffee lovers of all types, the menu is masterfully simple — offering only coffee, iced coffee (despite the inexplicable absence of choice), tea and different sizes of espresso with milk. The available roasts, which are newly selected each season, are carefully explained by the knowledgeable and caring baristas. Upon selection, the employee behind the counter meticulously grinds the coffee beans and brews each and every cup with a glass Chemex pour-over style brewer, which patiently yields a mug-full of deliciously bold Ethiopian coffee. This careful focus on preparation is an immensely refreshing departure from the massive, impersonal Starbucks drip brewers, required for the current American generation, which incessantly seeks convenience. Do not take coffee to go at Revelator. Like the baristas, be patient. Go when you need to clear your mind of pressing responsibilities for a half an hour, kick back and enjoy a perfect macchiato as the trains roll past. A previous version of this article stated that the Revelator Coffee Co. is based in New Orleans. The company is based in Birmingham.